Best Price on the Internet -- Limited Time Offer! Most vendors are at 19.95 or more. For a limited time we are offering this modern, highly effective nonlethal weapon for wholesale prices. Now a new model with even higher voltage output,the Li'l Guy Stun Guns have 12,000,000 Volts Output! New Colors, Lizard, Green and Leopard. Stun Master Li'l Guy Stun Gun with flashlight and FREE Upgraded Nylon Holster. This stun gun is smaller and more compact than ever and is easy to conceal in your hand. Its also rechargeable and has a flashlight. Most importantly it has a more powerful 12mm output to shock your attacker into retreat. This is a very narrow stun gun that you can wrap your hand around to conceal and to maintain a good grip in an altercation. Also the small size makes it much better to conceal until you are ready to surprise your target. 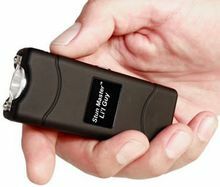 This is one excellent little stun gun with a very small form factor and very big bite! I really like this stun gun for its small, yet grippable size and its rubber skin. The combination make this stun gun easy to use and a great choice for anyone who wants a stun gun taser for self defense. Don't let the name Stun Master Li'l Guy fool you. It has a beast inside just waiting to be released. Just press the shock button and the Lil Guy spews 7,500,000 12,000,000 volts out of the metal probes. This is a very powerful, yet nonlethal weapon as it produces a shock capable of bringing a large man to his knees in only seconds of activated contact. Lifetime Warranty if you buy from us only. We do not ship stun guns or tasers to DC, NY, IN, HI, MA, MI, RI or outside the USA. Also we cannot ship stun guns to Chicago, IL.,Denison, IA. We can ship a stun gun to IL if you fax your current FID card to us at 888-345-2533. In Wisconsin, a concealed carry permit is required to purchase a taser or stun gun. Please fax a copy to us at 888-345-2533 with your order.